September 1, 1977 Ethel Waters, blues and jazz vocalist and actress, died. Waters was born on October 31, 1896 in Chester, Pennsylvania. She began to sing professionally in 1913 in Baltimore, Maryland. For several years she toured on the Black vaudeville circuit. In 1921, Waters became the fifth Black woman to make a record. In 1933, Waters starred in the all-Black film “Rufus Jones for President”. 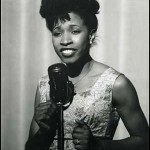 That same year, she took a role in the Broadway musical revue “As Thousands Cheer”, where she was the first Black woman in an otherwise White show. In 1949, Waters was nominated for an Academy Award for Best Supporting Actress for the film “Pinky” and in 1950 she won the New York Drama Critics Award for her performance in the play “The Member of the Wedding”. In 1950, she starred in the television series “Beulah” but quit after complaining that the scripts portrayal of African Americans was degrading. In 1962, Waters was nominated for an Emmy Award for Outstanding Single Performance by an Actress in a Series. Waters was posthumously inducted into the Gospel Hall of Fame in 1983 and in 1994 the United States Postal Service issued a commemorative postage stamp in her honor. Waters’ recordings “Dinah” (1925), “Am I Blue” (1929), and “Stormy Weather” (1933) were inducted into the Grammy Hall of Fame as “qualitatively or historically significant”. In 2004, “Stormy Weather” was listed on the National Recording Registry at the Library of Congress. Waters has two autobiographies, “His Eye is on the Sparrow: An Autobiography” (1951) and “To Me, It’s Wonderful” (1972).